One of the most popular Nissan models has been totally redesigned making it the sleekest and smartest Qashqai model to date with the most up to date technology at your fingertips. The Super Smart SUV’s front end has been completely revised and now features a V-motion grille creating the sharpest appearance yet. The Qashqai allows you to experience driving in the city like never before. The interior of the Nissan Qashqai will also exceed your expectations as it oozes superiority with a Panoramic Glass roof. The minute attention to detail is obvious when stepping into the Qashqai as the leather gear lever and instrument panel have been designed and executed with exceptional precision. You can feel the quality when gripping the D-shaped premium steering wheel before you’ve even started the engine. The Qashqai model has a Two Person Memory Seat Function with luxurious 3D quilting available in Nappa leather and if that wasn’t enough heated front seats for those colder mornings. 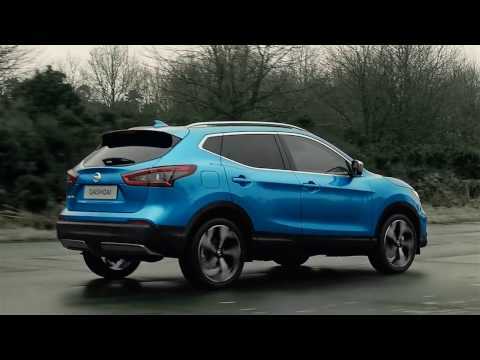 This clever beauty’s Qashqai Technology System simply links up your phone when you start the engine and navigation couldn’t be easier with Nissan Connect Navigation Access and Advanced Drive-Assist Display. You’ll gain a whole new level of confidence as the Qashqai takes control with Intelligent Park Assist, Intelligent Emergency Braking, Lane Departure Warning and Adaptive Auto Headlights leaving you to sit back and enjoy what matters. Additionally, Blind Spot Warning, Moving Object Detection and Rear Cross Traffic Alerts will keep you alert on the road. The Qashqai’s cargo capacity is very surprising. With seats up the capacity is 430L and an impressive 1,598L with the seats down. If you’re still left wanting more, the Qashqai encompasses a ‘Secret Spot’ keeping your valuables safe and your car free from clutter with multiple storage compartments hidden around the car. The dynamic fuel efficient engines include: dCi 110 – 6 Speed Manual, dCi 130 – 6 Speed Manual, dCi 130 – Xtronic Automatic and dCi 130 – 6 Speed Manual 4WD including a Sport Mode option. Let Nissan’s revolutionary ProPILOT take on the stress of long commutes and traffic jams, so you can sit back and take pleasure in your drive! The ProPILOT’s performance is based on road information obtained through a mounted camera equipped with cutting-edge image-processing software. Nissan’s sophisticated, autonomous driver technology aims to assist drivers in stop/start traffic, reduce driver fatigue and improve safety levels for both drivers and pedestrians. Designed for use in single-lane traffic, the ProPILOT employs intelligent lane intervention, intelligent cruise control, lane keep assist and Traffic Jam Pilot to help you stay in control and take pleasure in a comfortable drive. In slow-moving traffic, the ProPILOT maintains a safe distance from the car in front by automatically controlling the accelerator and brake. Based on the flow and speed of traffic, the ProPILOT ensures you maintain the correct speed whilst remaining centred in lane; it will even bring your car to a stop and move off again when required. The ProPILOT is extremely user-friendly: it can be easily activated or deactivated at the push of a button to suit your driving needs. Gain a new level of confidence and control with the exceptional ProPILOT technology from Nissan and experience driving like never before!